The Ford Windsor V8's are great conversion engines for many Jeeps. Many factory manifolds complicate or impede good engine location and installation, restricting flow for a motor that really wants to breathe. Our headers provide a compact, short, and block-hugging design that will free up your installation for professional results. Included are Left and Right headers, header-to-head bolts along with instructions. Gaskets and collector bolts are not included. The basic header is offered in natural steel, which the customer can optionally have finished in a variety of hi-temp enamels or other finishes that will offer rust protection and good appearance. The best thermal and corrosion protection for your headers is our Aluminized Ceramic Coating. This finish offers the added benefit of lower under-hood temperatures and the highest level of protection to the header. These headers will work with nearly all major Windsor engines, including the 289, 302, 5.0L and the 351/5.7L. They will not work with the GT40P heads. 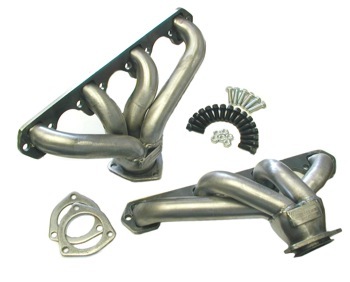 Best fit for most Jeeps and these headers work well in most all applications. Recommended installation to the engine is high temperature RTV such as Ultra Black® without a gasket. We have found this works exceptionally well. Some have used the original equipment type MLS (multi-layer steel) gaskets with good success. Collector gaskets and bolts are not included with the headers. We recommend using solid copper gaskets to avoid blowouts at that joint. Instructions are provided with the headers. One circuit under the oil pan, just in front of the sump merging into the opposite circuit which is typically run rearward on the side of the Jeep opposite that of the drop of its transfer case. As above, but under the bellhousing slope. As above, but behind the transfer case. Then, the exhaust tailpipe can exit the Jeep on either the driver's or passenger's side.